Hippy Hill on a Saturday. I love Golden Gate Park. 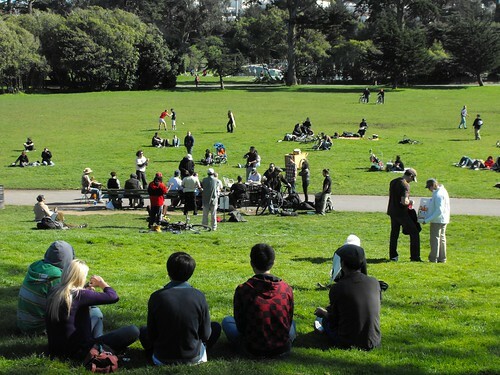 Everyone in San Francisco has this amazing multi-million dollar backyard that we all get to share. And I never have to worry about mowing the lawn. All the stress, price gouging, and road rage that comes with living in the city evaporates away on a sunny day in the park. That’s the pay-off. That’s one of the things that makes it all worth while. There’s nothing in the world that I would trade my sunny weekend days in the park for. Hippy Hill is a melting pot. Just like crack being cooked in a microwave. You have college kids, high school kids, homeless kids, homeless dogs, crusty punks, screaming crazy people, drug dealers, drug buyers, tourists, cops on motorcycles, cops in patrol cars, kids, soccer moms, frisbee heads, jugglers, and this amazing eclectic assortment of drummers and horns that jam out on the weekend. There are some people that I’ve been seeing in this drum circle for over a decade now. This is our backyard. Lately I’ve been coming here and thinking a lot about patience. These cats in the drum circle have a lot of patience. I’m talking Dali Lama levels of patience. People get in their face and plant themselves in their personal space to take pictures of them while they do their thing. It doesn’t faze them. I remember for a while there this one guy was showing up with an electric guitar and amp and rocking out, it just killed the mood. Everyone else is doing this organic music and this guy was showing up with an electric guitar and blasting them over. His skills sucked too, which made it that much more obnoxious. It didn’t faze them. The drum circle just went on. These guys have a lot of patience. I really respect that and find myself drawn here lately to just sit and think about that.